Many an attempt has been made at writing this informative post for you, but it seems that the pattern hasn’t changed. I log onto Pinterest, and get lost in all the pretty things it keeps showing me. After an hour or two of this digital drug, I go back to writing this post, but only after I look at one last board. Pinterest is addictive! And it is the hottest new social networking tool on the net right now. Morning everyone! It is Kim here telling you a bit about Pinterest. The reason I am writing this is because Filipa was addicted to Pinterest from the moment they sent her the email saying, “Your request was accepted, and now we invite you to join the world of Pinterest”. She just knew when she heard about it that she would love it. For me, it took a lot more persuasion. But now I am completely addicted. Pinterest is a virtual pinboard, a space to organise images that you find all over the internet. When I first heard about it, it sounded cool but not very useful. Once I’ve found all my images, what do I do with them? 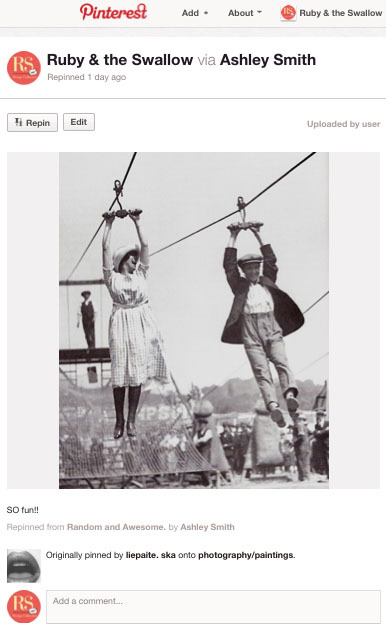 That was until I visited the site, and sunk down into the Pinterest time-capsule that just won't let you leave. Pinterest is a social media network, allowing users to share and collect pictures from the internet which link back to the original source. For bloggers, this makes Pinterest so useful in helping to credit the images we use. It is an online pinboard of interesting pictures – hence the name. If you want to join, you have to request an invite, or be invited by a friend already using Pinterest. This site is surging in popularity, and may have reached the 10-million-user mark faster than any other social network. It is connecting people all over the world with shared interests. Pinterest is a picture scrapbook of your inspiration, ideas, hopes and dreams. It has come at the perfect time as the Facebook novelty seems to be fading. 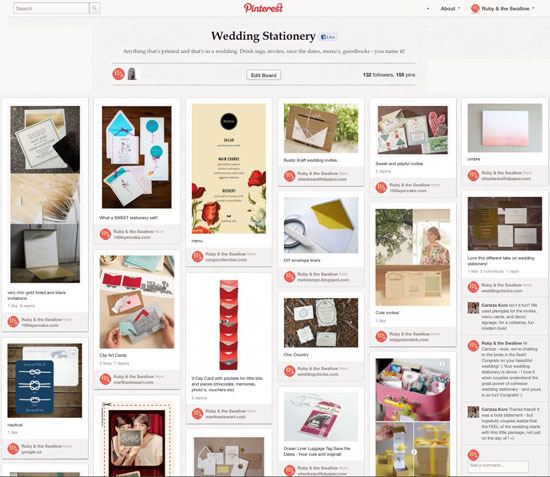 One of the more popular applications of Pinterest is wedding planning. So now you know why here at Ruby we love it! For the forest-themed invitations that we designed (see that post here), it was so easy as the bride merely told us to look at her Pinterest wedding board to see what she liked – and from there, we had such a great idea of what she was picturing for her invitations. People use their pinboards to plan weddings, decorate their homes, find fashion inspiration and organise their favourite recipes. The best thing about Pinterest is that you can also browse other pinboards created by other people – this way you can get inspiration from people with the same interests as you. A pin is an image that you add to Pinterest, from a website using the Pin It button, or uploaded from your computer. If you add a pin using the Pin It button, it links back to the site it came from. A repin is adding an image of another Pinterest user (that you find while browsing Pinterest) to your own board. When you repin an image, the user who first pinned the image will also get credit. Repins maintain the source-link of the image no matter how many times it’s repinned. A board is a set of pins. A board can be created on any topic, such as Wedding Decor, Dream Home, or My Wishlist. You can add as many pins to a board as you want. Our board below is on Wedding Stationery - we pin anything that interests us around the web on stationery we love. 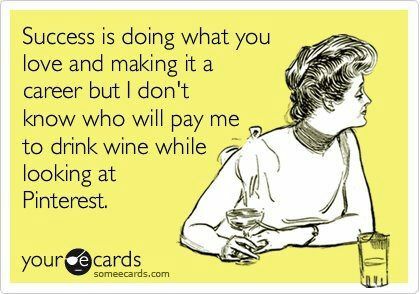 Pinterest is a social network, so you can "follow" other users whose interests you share. “Following All” means you'll have all of a user’s pins on all their boards shown to you in real-time on Pinterest. If the user makes new boards, you will automatically follow them. You can follow individual boards if you're only interested in seeing a user's pins to specific boards. You can unfollow boards and users at any time: they will not be notified. So go on - join Pinterest and be inspired! Visit our Pinterest page here and browse our boards, to give yourself a good idea of what the site is all about. Images and information credited to Pinterest.